influxDB is a fast open-source time-series database package. It can run on a variety of platforms and is also available as a managed, fully hosted service, from several vendors. As part of their “TICK” stack, InfluxData provides tools to facilitate collecting data from a variety of sources, as well as tools for infrastructure monitoring, alert management, data visualization, and database management. The popular grafana visualization tools also work well with influxDB. IoTaWatt fully supports the influxDB HTTP API for sending data to influxDB at a specific interval of 5 seconds to one hour. Like other similar IoTaWatt services, continuity of updates is maintained despite outages that may interrupt the communications. This tutorial assumes you have established your own instance of influxDB or subscribed to a hosted service. It does not attempt to explain how to install or use influx or any of the related visualization tools. There’s a whole universe of enthusiastic users at the influxData forum, where you can get help with anything and everything. To configure the influxDB upload service in IoTaWatt, Hover over and click from the dropdown menu. Here you specify what you want IoTaWatt to upload. Number of seconds that each data point will represent. The trade-off is between higher resolution (small interval) and minimizing the storage requirement of the data over time (larger interval). IoTaWatt accepts any value from 5 seconds to 3600 seconds (1 hour), in 5 second increments. Although not a strict requirement, it’s best to use a number that is an even factor or multiple of one minute: 5, 10, 15, 20, 30, 60, 120, etc. Number of interval postings to aggregate into a single HTTP request. Specifying 1 will send a data packet to influxDB at each interval. If your interval is 5 or 10, it will send a packet every 5 or 10 seconds. That’s fairly inefficient and can be problematic when there are internet connectivity issues. By specifying a larger bulk send, IoTaWatt will aggregate the posting data for the specified number of intervals and send the data in one packet. For instance if your interval is 10 seconds, specifying bulk send = 6 will cause data to be sent every 60 seconds. Large bulk send values will cause any real-time dashboards to update less frequently, so you should strike a balance. IoTaWatt keeps all of the data in the SD data log, so there is no risk of losing data by using this feature. Should there be any failure to deliver, IoTaWatt will pick up with the last successful posting when the problem is resolved. URL of the influxDB server. The URL must begin with http:// (not https://). The url may contain a domain name or an IP address. The :port number is optional and defaults to the influxDB default of :8086. 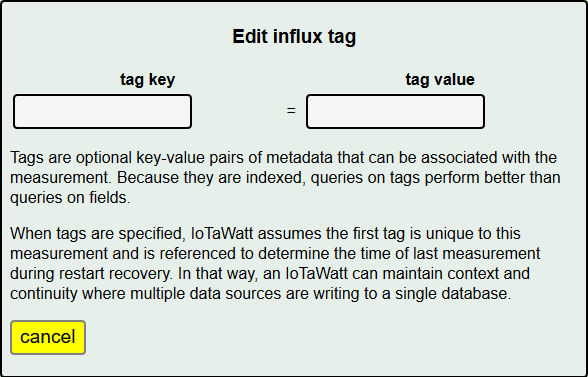 Name of the influxDB database that you have created to be the repository for the IoTaWatt data. Optional name of the influxDB retention policy that you want to associate with the measurements that are written to influxDB. If not specified influx will use the default policy. If you specify a retention policy, it must be defined to influxDB before data can be written. Optional security credentials. If specified, IoTaWatt will use standard authorization headers with these credentials. Name that you assign to the measurements that IoTaWatt will be posting. The specification can be a constant string, or can include variables as explained below under variables. Note that if not specified, the variable $name will be used. Each measurement contains a field key and field value. The field value is always the value specified in the “calculator” function. The field key to be used is specified here. It can be a constant string or can include variables as explained below under variables. If not specified, the default field key in each measurement is the string ‘value’. Note that measurement, tag-value, and field-key are specified above and can be fixed strings or can be or contain variables. Some examples of the various ways this can be used to create different types of measurement specifications are given below. As each measurement is written the $name and $units variables are assigned the value specified in the individual measurement specification. 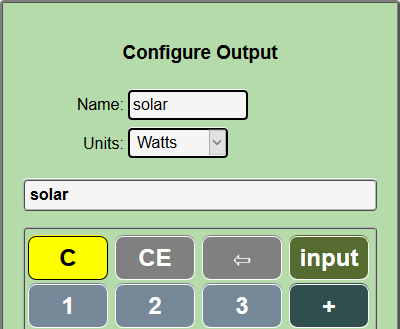 The units of the field set defaults to watts. While Watts is the typical unit reported, the following additional units are available. Once configured, a new influx service will be created. The current state of the service and the date/time of last update will be displayed under the influxDB tab in the status display. The service can be started and stopped using the start/stop button. When a running influx service is changed, the service is automatically stopped and restarted. Variables provide a way to further customize the way data is organized in your influxDB database. This tutorial will not get into the implications of different conventions, except to say that future generic visualization templates may be based on using the default specifications for measurement and field key. $device - The name assigned to this IoTaWatt device in the device configuration section. When these variables appear as all or part of the string specified for measurement field key or a tag value, the instance of the variable name is replaced by it’s value. Evaluation proceeds left to right in a string.